The evolving population of North and Middle Caicos. North and Middle Caicos are the two largest islands in the Turks & Caicos archipelago but surprisingly, their combined population—across nearly 100 square miles and eight villages—comprises less than 10% of the country’s total residents. Tranquil and pristine, both islands boast a verdant green landscape with rolling acres of indigenous trees, shrubs and plants yet untouched by development. They offer few of the conveniences of Providenciales—not a single bank or coffee bar in sight. What they do offer is a rich, peaceful lifestyle, a vibrant cultural heritage and a remarkably strong, interactive community. The communities and families within North and Middle Caicos are intertwined on all dimensions and since the causeway linked the islands in 2008, residents move comfortably back and forth for schools, government services, visits with friends and family, churches, and special events, with a variety of small businesses steadily moving ahead. Residents of North and Middle Caicos love, are proud of, and want to protect their islands. The physical joining of the two islands has brought out the best for everyone, and given us a stronger identity. I came to TCI just over 22 years ago, witness to the startling pace of change as it changed from a sleepy, unknown place of 12,000 residents to a thriving, internationally famous, vacation destination with a population of nearly 40,000. My friends and family considered me mad to invest in a resort on Middle Caicos, but partnering with Dale Witt in 1995 to develop the Blue Horizon Resort was the beginning of a wonderful adventure. Amazing as it seems, the environmental purity, social stability and breath-taking scenery that captured my heart 20 years ago still remains intact on North and Middle Caicos. The population demographics, however, have significantly changed. Some deaths, some births, some emigration, some immigration—all contribute to the changing faces of these islands, with more change on the horizon. 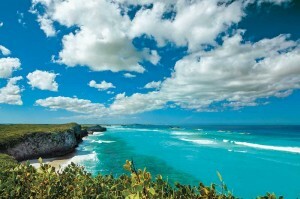 This is the spectacular north shoreline of Middle Caicos. Middle Caicos’ total population still remains under 300 people, but whereas in 1994 the average age was 65 and the island filled with grandparents and primary schoolkids, today the average age is around 50, with people of all ages living here. The elders who dominated local communities have passed away, new job opportunities have kept young families here, the causeway allows teenagers to stay home instead of boarding out for high school and the steady influx of foreigners—working / retiring/ with their families—all create the warm, friendly mix of residents now living on the island. North Caicos’ total population has more than doubled in the past 20 years, from 1,500 in 1994 to over 3,500 now. Foreign workers account for a huge portion of the increase, followed closely by an increase in expatriate residents/vacation homeowners and a small number of Belongers returning home to work. The growth of day tourism from Providenciales encouraged small business growth on North Caicos for car rental, restaurants, shops, gas stations—predominantly owner operated/family businesses, but needing some foreign workers to operate. The expansion of Parrot Cay also needed a strong work force so the demand for labourers/gardeners/domestic workers/hospitality staff continued to grow. And as more vacation homes came on the market for rent, the increase in longer-stay visitors on these islands further enhanced the need for workers in all these commercial operations. 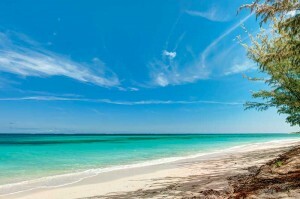 The quiet beaches of North Caicos are part of the island’s beloved lifestyle. The evolving population has long intrigued me, more so as my relationships with local residents deepened and matured. North and Middle Caicos folk are unusually hardy and enterprising, well used to making their own way—and a prosperous way at that. The new faces came from Haiti, the Dominican Republic, Jamaica and even the Philipines, hoping to find jobs. The new faces came as North American/European investors looking to build a development or holiday home for rental. And the new faces came from a cosmopolitan group of retirees hungry for natural beauty and tranquility. Overall then, the changing faces of both islands now comprise a multicultural potpourri, fortunately well grounded in the strong local culture. It is an exciting phenomenon and very welcome! The idea came to me to interview some of my neighbours, those arriving in the last five years or so, to hear their stories and learn their perspective. I thoroughly enjoyed the hours of fresh and lively conversation, sharing future visions and offering advice for newcomers. In general, all these new residents wish more people would come and visit North and Middle Caicos, stay a while and truly explore the possibilities offered here. It is a good place, full of good people—a safe haven in a tumultuous world. And the peace and quiet so vital to all who live here is a treasure well appreciated. Let my neighbours’ tales shine a bright light on possibly realizing your own dreams. Natasha Neat and Sharn Gray are both in their early thirties, and they came home to live in 2015. Tasha was born and raised on Middle Caicos, while Sharn was born in the Bahamas but raised on North Caicos by his grandmother. Interestingly, they were good friends when both attended Raymond Gardiner High School in Bottle Creek, North Caicos, but lost track of each other in the busy whirl of community college and work on Provo. Tasha always wanted to come home to live, but finding full time work was difficult. In 2007, Sharn and Natasha were both working for government, rediscovered each other and began their life together. Sharn was transferred to North Caicos in 2014, and soon, Tasha moved to join him. As months roll along, they both agree that staying here is what they want—to be near family most important. Many of their friends in Provo find their decision astounding: “It’s so boring! Too many bugs! Nowhere to go! Nothing to do!” (I note that peace and quiet is not for everyone.) Natasha and Sharn now look to be building their own home on Middle Caicos, confident that the growth they see steadily coming to both islands will provide a secure future for them and their daughter. Wasting no time, in 2013 they purchased a half acre hilltop lot with fabulous 360º views and by early 2016 the house was ready for Rita to arrive with the cats! Rita is an artist, thrilled to have time to paint the gorgeous views from their ridgetop home near Bambarra Beach, happy to volunteer with the TCSPCA and beach cleanups, content with the isolation that allows her to be the only person walking on the beach! Dave has decided he is semi-retired, needs projects to keep him busy and is looking into several business opportunities. Overall, they are most appreciative of the warm and welcoming community which offers acceptance and respects privacy. The security offered for personal safety and for financial investment is also deemed a tremendous asset. Kadra Been-Handfield was born and raised on Salt Cay, a descendant of the Been clans. She is similarly a descendant of North Caicos, as she is also of the Duncanson clans. After high school in Grand Turk, she moved to Provo and began a long career as a legal assistant. She met her husband-to-be Darville Handfield in 2001 and began to explore his home of North Caicos, and after several years they wed on- island. Kadra and her husband, who has no intention of ever leaving his native homeland of North Caicos, long ago recognized the business potential offered there. Since 2003, together they started several businesses: Liquors Plus, Deep Creek, Auto Parts Plus/Carquest, Nique’s Food Mart and, just this October, Turquoise Rent A Car began operations. Kadra is an active and intelligent woman. She is in a unique position to evaluate the situation on North Caicos and, for her too, peace and quiet looms as the major factor contributing to the lifestyle on offer here. For several years she commuted to Provo by boat, but once their daughter Darnique was born, she wanted to be close-by more of the time. Kadra is sure great potential for development lies ahead and within two to five years, hopes the airport will reopen to private jets for Parrot Cay guests, to private pilots flying in to their own homes or developments, to provide much easier access for tourists and maybe even to encourage a cargo flight! Howard is a finish carpenter/cabinetmaker who joined Charlie’s Construction Company, bringing his delicate woodworking skills and equipment to a growing business in North Caicos. Patti is a hairdresser who worked at a local salon until it was destroyed in a fire. She is currently sorting through various ideas for a new venture and enthusiastic about all the possibilities. Both see terrific potential for growth, in particular the expansion of the building industry with a strong need for skilled tradesfolk. The Bartels’ enthusiasm for their lifestyle is contagious and they do wax lyrical about the evening breeze on their porch, the amazing stars, the unspoiled beauty—a lifestyle which leaves behind all things urban, traffic and commuting, noise and stress. Their advice is to visit a few times, get to know people, delve into the miles of beaches and trails, and remember it is not always like a piña colada vacation! John “Jay” Higgs is a son of the soil, born and raised on North Caicos. After high school on Grand Turk he went to the Bahamas and began work in the construction trade under his uncle, completing an electrical apprenticeship. At 21, back in TCI, he worked general construction in Provo but came back to North Caicos for two years with his young wife and family for a project on Parrot Cay. He started work on his home in Bottle Creek but moved back to Provo as there was not enough work on North Caicos at that time. Twenty years later, ten in Provo and ten in the Bahamas, Jay is back in North Caicos to stay! His company JAH Construction is up and running, ready for new building work across North and Middle Caicos, and he brings an incredible array of skills and experience to the task. He is excited about the growth evident in the construction industry here, with several large projects taking off this year, and a constant stream of new private homes being built. His home in Bottle Creek will be ready for Christmas, and a new child is due in November. Jay is very happy to be home to stay. It is time for a lifestyle change he says, “It is important to have time to relax more, time to go to the beach on Sunday, time to be close to family, time to have fun with your neighbours. None of that happens on Provo.” When I asked him about what he sees for the future of North and Middle Caicos, his face lit up as he pronounced an enthusiastic, “Great things—these islands will shine!” His advice to other locals is to come home and try it here because there is room for all skills and lots more businesses. There is no doubt that the peace and quiet of North and Middle Caicos are considered by all who live here to be our greatest assets. The open space between the villages gives us calm vision out over the natural landscape, reminding us daily of the beauty we are blessed with here. The dark night sky lets us gaze in awe at the stars, reveling in the gentle sounds of nature. The warm and friendly faces of our neighbours bring easy smiles to every day—and soon all are your neighbors on these special islands. Living here inspires us to take the time to relax, take the time to appreciate, take the time to be grateful for our life. The steadily evolving and increasing population reflects the quality of life possible here inclusive of growth potential, friendly communities, a pollution- free ecosystem and safe investment environment. Real estate for sale has something for everyone from multimillion dollar commercial opportunities (resorts/subdivisions/developments) to high-end vacation rental villas ($850,000 to $1.5 million) to waterfront cottages under $500,000, beachfront condos and townhomes for $150–$200,000 and interior building lots under $75,000. At this time there are over 15 construction projects ongoing on North and Middle Caicos! The business opportunities are wide open from traditional trades (plumber/electrician/mechanic) to alternative energy, from fruit orchards to hydroponic farms, from watersports to tourism marketing. And in this country there is no income tax, no property tax, no sales tax! I often laugh with myself, using the same phrase for years: North and Middle Caicos are for the brave, perhaps best suited to those who would have liked to be a pioneer or an explorer. These islands offer themselves fully to those of stout heart and unobstructed vision. Whether you come to start a small business, take forward a development, partner with an existing business or simply to retire, please know that the opportunities are plentiful, waiting for you to investigate and make your choice. I am well content to know I will live out my life watching these islands slowly and sustainably grow, happy to be sharing this great lifestyle with new neighbours. Come and stay a while with us soon. Sara Kaufman moved to the Turks & Caicos Islands in 1994 after 15 years in Europe as a top management consultant. She fell in love with Middle Caicos and was one of the original developers of the Blue Horizon Resort on Middle Caicos. She co-founded the Middle Caicos Co-op to promote local artisans and traditional TCI handcrafts with friends working on the Crossing Place Trail Project, and met her partner, Daniel O. Forbes, in 1998 at a local dance to celebrate the opening of the trail! Daniel and Sara opened Daniels Café in 2000, an iconic Middle Caicos landmark. Their next venture was to set up Forbes, Forbes & Forbes Ltd., (aka Forbes Realty TCI) in 2005 to sell real estate. While initially dedicated to the private island of Pine Cay, within a few years they were proudly promoting properties in North and Middle Caicos too. They launched the Go Beyond Provo campaign in 2012 to raise visibility for real estate opportunities on the family islands, with the goal to promote their charm, tranquility and investment value. By choice Sara relishes privacy and tranquility, living on Middle Caicos now for 22 years. Contact sara@forbesrealtytci.com or call 1-649-231-4884 and visit www.forbesrealtytci.com to explore the real estate for sale on North and Middle Caicos, Salt Cay and Pine Cay.